Many of the women who attended the Azad Maidan protest were told that the "Triple Talaq" bill is the "first step'' towards the Uniform Civil Code. An estimated 50,000 people protested against the instant "Triple Talaq" bill. 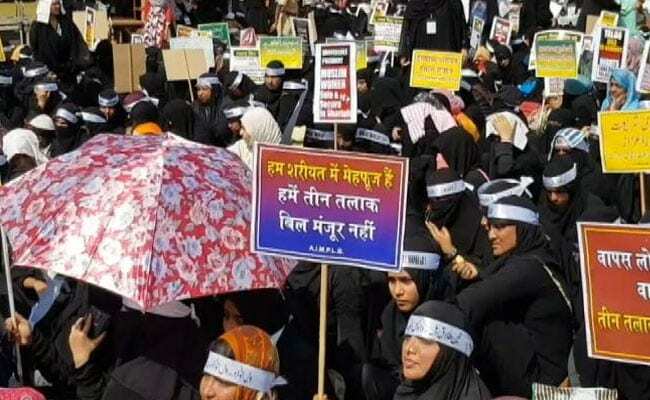 Mumbai: In an effort to garner attention, the All India Muslim Personal Law Board has put women at the forefront of the protest against the Muslim Women Protection of Rights in Marriage Bill 2017 to make the instant "Triple Talaq" a criminal offence. Thousands of burqa-clad women gathered at Mumbai's Azad Maidan, a designated area for mass protests in the city, as men cited 'danger to religion'. The crowd was estimated to be over 50,000. However, many of the women who attended the protest were told that the bill is the "first step'' towards the Uniform Civil Code, that the BJP has long pushed for. Some did not even know what the finer details of the bill were. Dr Asma Zehra, head of the women's wing of the All India Muslim Personal Law Board told NDTV, "We will not tolerate any interference in the Muslim Personal Law. The bill that has been tabled by the government has been brought in a hurry." "The Supreme Court has set aside instant Triple Talaq. That means such a talaq has no meaning. Now when there is no offence, the bill sending husbands to jail. If the husband is sent to jail, who will look after the woman. When a civil matter is criminalised, the woman will have to bear the brunt of it. The bill is not in women's favour," Dr Zehra said. When asked about the cases of instant Triple Talaq where women have suffered, Dr Zehra's explanation was hardly satisfactory. "In Islam marriage is contract. If a husband does not want to keep his wife it does not say that you have to live with your husband. If someone is divorced they can remarry again and the family system takes care of such women," she said. However the Muslim Personal Law Board's views did not find takers with several women from the community itself. Islamic Scholar Dr Zeenat Shaukat Ali told NDTV, "They are failing to see that that this bill is in favour of women and that the government is trying to do should have ideally been done by the All India Muslim Personal Law Board itself. That would have created deterrence to the practice of instant Triple Talaq." "Even after the Supreme Court's order banning instant triple talaq the practice did not stop. The personal law board did not do anything about it. In the order a couple of judges have said that Parliament must enact a law and so that's exactly what parliament is doing. This is in consonance with Islam," Dr Zeenat Shaukat Ali said.